July 26th, 1936: “A Souvenir”…. 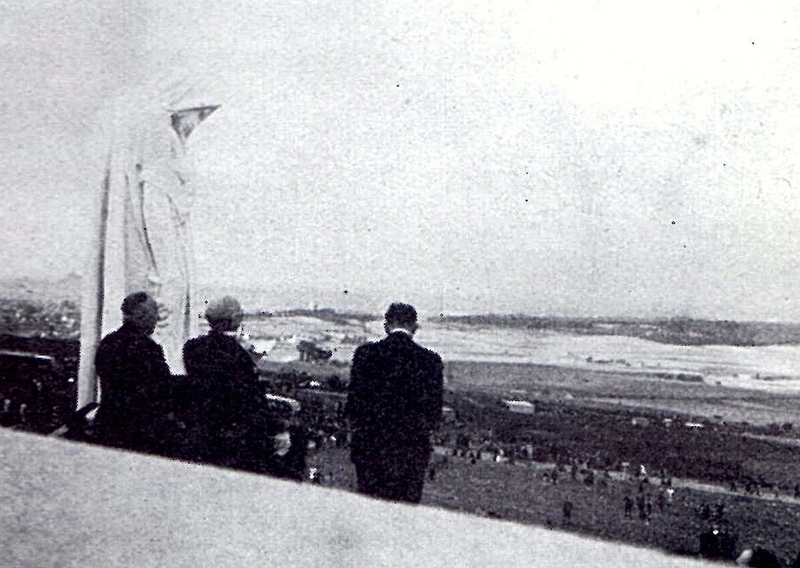 Here’s my favourite story arising from the 1936 Vimy Pilgrimage and the unveiling of the memorial: After the official ceremonies, an unofficial ceremony took place, presided over by Canon Scott. In the 1920s, many of the original crosses that marked the soldiers’ graves were removed and replaced with headstones. The crosses were sent back to Canada and burned. Canon Scott returned the ashes of these crosses to France, and solemnly scattered the remnants of those original grave markers at the base of the Vimy monument. After the ashes were scattered, anyone in the crowd that wished to lay wreaths on the memorial was invited to do so. But it gets better: Canon Scott also distributed a broadside with two poems on it while on the pilgrimage, titled A Souvenir. They were signed by Scott, and dated July 26th, 1936. Two of these very delicate broadsides exist in scrapbooks of the Vimy Pilgrimage in the Canadian War Museum archives. A third was recently acquired by yours truly, from Lord Durham Rare Books. (and I’ve been on Field Punishment ever since). It’s a wee little broadside, measuring only 3.5″ x 6.25″, and I don’t imagine many of them have survived. I’m thinking of having it framed with a photograph of Scott, alongside a Vimy Pilgrimage Medal, coin, & photos of the monument. And if I make it to France for the 2017 anniversary, I’m going to have a bunch of facsimiles printed so I can hand them out in the crowd. 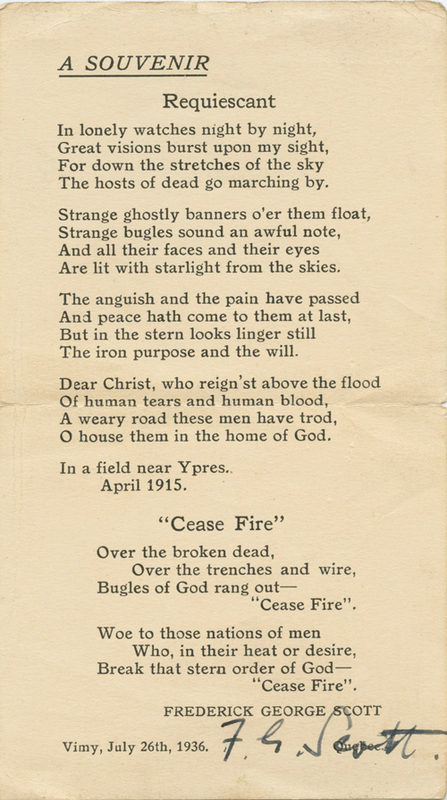 This entry was posted in Uncategorized and tagged Canon Scott, Poem, Vimy Ridge. Bookmark the permalink. 1 Response to July 26th, 1936: “A Souvenir”…. Will Bird’s “And We Go On” (1930)…. Will R. Bird’s “Kind to Dogs” (1931)….